I remember as a teenager and especially when I knew I was going to marry my husband, I knew what I wanted my engagement ring was going to look like, then the day came when he proposed and the ring was nothing like I had pictured, but it was amazingly beautiful because he picked it out and it was from his heart..
Anjolee is a custom jewelry design company based out of San Diego, California. 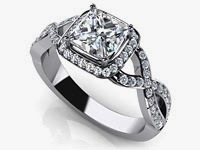 Founded in 1977, they've been manufacturing high-end diamond jewelry for retail sale for nearly four decades, but it's only been in the past several years that they moved online with a web model that lets you fully customize your own diamond jewelry pieces from start to finish. 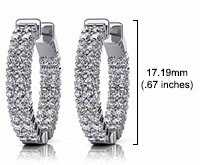 You can create diamond stud earrings bracelets, pendants and even diamond wedding rings! Ladies, take a look and drop some hints to that significant other in your life, it only takes 3 business days to manufacture and then 2 days after fed ex can have your package delivered.